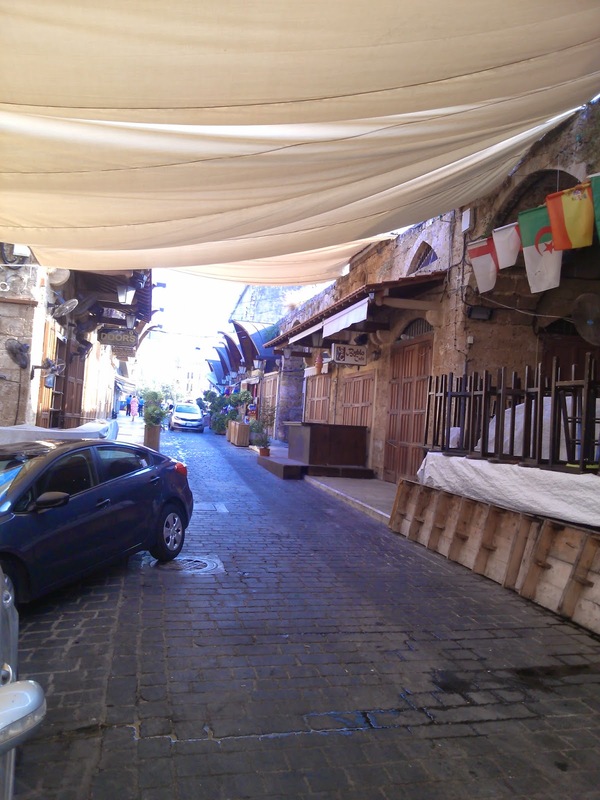 So, Byblos is Jbail when it isn't working off its passport - the local name. This city has been continuously occupied by people for at least nine thousand years, and possibly over ten thousand. It's definitely the oldest continuously inhabited city in the world. As such, the city has collected names like a social butterfly collects online handles. 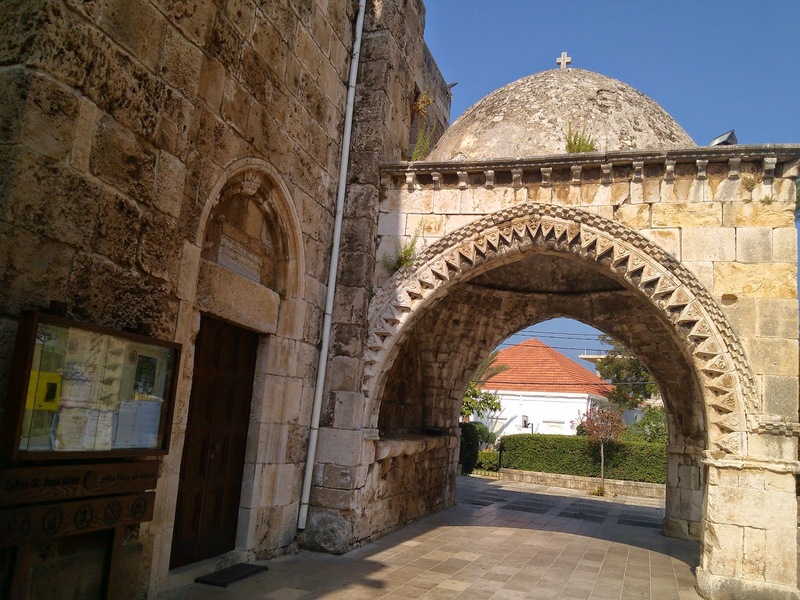 It's Byblos to the Greeks, Romans, and those of us who take place-names from classical sources; it's Jbail to the locals and Arabic-speakers, it was Gibelet to the crusaders and Genoans, Gebal to the Phoenicians, Gubal to the ancient Caananites, and Geval to those that wrote the Bible. The name of the Bible itself is derived from this city, which the archaic Greeks associated with papryus and thus gave the product the name of the city from which they traded it originally; it eventually was associated with the book, and thus "biblos". The city is mostly Maronite, with some Shia, and at least one street's worth of Armenians, because I took a wrong turn and found myself in the town's small Armenian quarter, which turns out to be a single dead-end cul-de-sac on the bayside south end of the city. 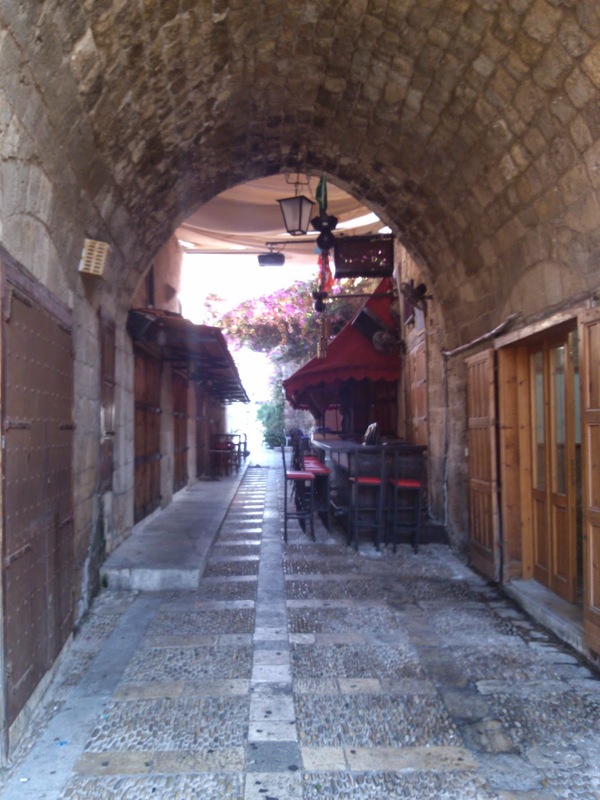 My hotel was about a mile's walk from the tourist centre of Byblos, which I was told was a safe enough walk. If you walk out where the drivers can see you, and you can see the drivers, it isn't crazy dangerous to walk the roads. Assuming that you're walking in a place where the fumes won't choke you. There were clusters of men waiting for trucks to pick them up - day-labour, as anyone in the American South or Southwest would recognize. 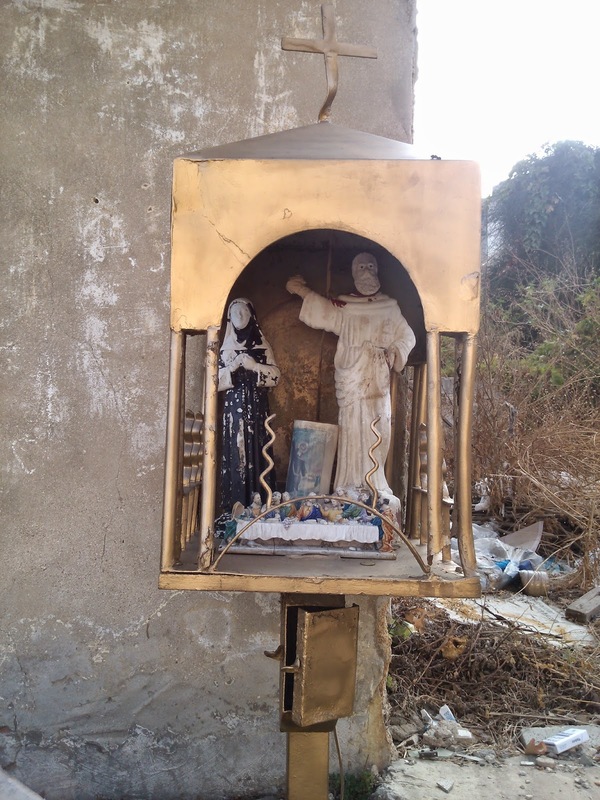 The area was recognizably Marionite - there were the occasional tiny roadside shrine like this one, scattered every five hundred meters or so along the road. This one was particularly battered, but the better-kept ones were usually of the Virgin Mary. I got there too early in the day for the Souk to be active - the shop-keepers were just opening their doors when I walked through initially - but you can get an idea of how it looks. Vaulted corridors separating brick alleys with sailcloth flying overhead to keep off the merciless August sun. Lots of fossils, food, touristy trinkets, and for some reason, at least three places selling shoes. I almost stopped to buy a new pair, since my current pair had almost blown out by that point, but I didn't have the energy to really get down to figuring out if they'd have any tennis shoes in my size in a reasonable color - they tended towards bright primary-color flashy trainers, not at all my style. As I said, this is a Maronite town. This is L'eglise St. Jean-Marc, a Maronite church with, I think, an attached school for young children. 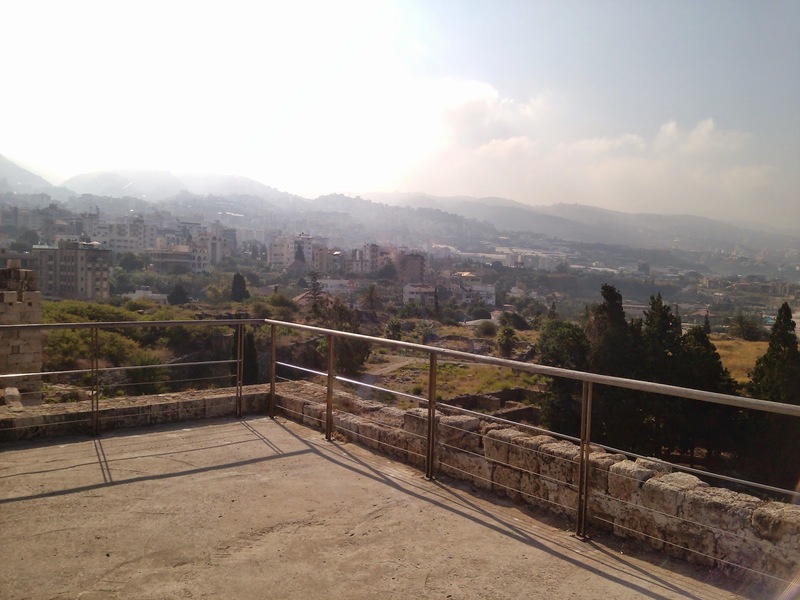 It was quite a large compound, to the north and east of the souk and the ruins of Byblos of which, much more next time. 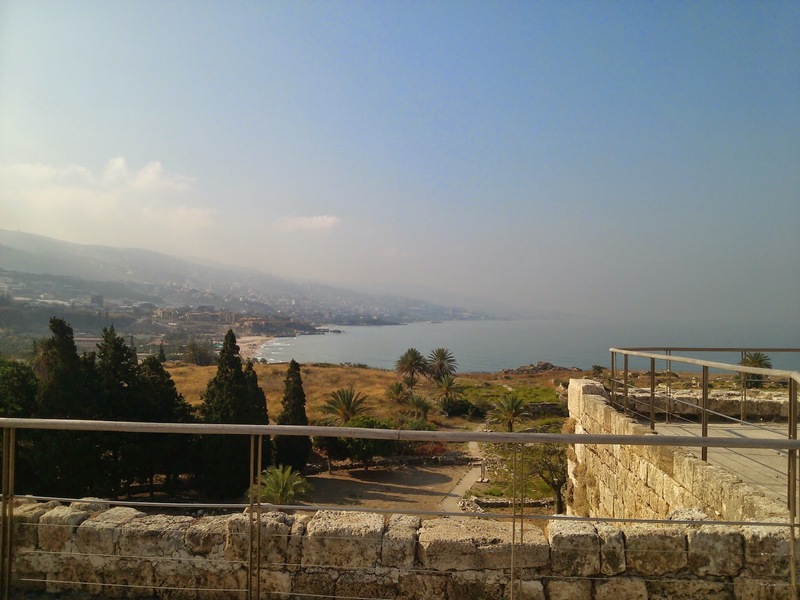 When we actually got to Byblos, I discovered my driver had no idea where my hotel was, or even what it was named - I could hear him calling it "Byblos Factory" in otherwise-unintelligible Arabic as he asked every person we came across for directions. The man had a functioning smartphone with a mapping function, I have no idea why he didn't use it, but still - we stopped at a half-dozen places, asking police, gas station attendants, other taxi drivers - until someone finally pointed us in the right direction and I arrived. Sigh. As I said, Victory Byblos. 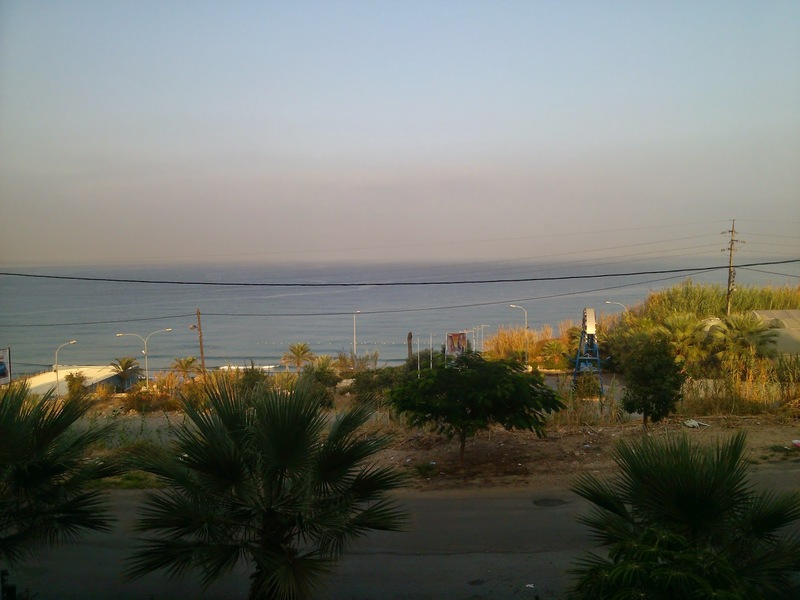 It's a small hotel well outside Byblos proper, on a dusty exit above the coastal road seaward from the highway itself. It's across the street from a pair of small beach resorts, which double as dance clubs in the evenings, complete with loud music you can hear from the second story rooms with the doors closed. They like to conclude their nightly celebrations with fireworks, so don't expect to get to sleep early if you have a seaward view. Because I showed up early, apparently they scrambled to give me a room and I ended up with a room which had been prepped for some newlyweds, complete with rose petals scattered all over the place. The hotel cuts costs by including your room key in the room's electrical grid - there's no power until you stick it in the right slot. Oh, well. At least I was able to figure out their wifi, which is more than I could say of the Bayview Hotel's rather confusing Internet situation. I spent a lot of time hanging out in the lobby working through email and checking on news. Until the second day, when I was informed that there would be another wedding reception in the lobby that afternoon. Apparently August is marriage season in Lebanon! Ah, the Corniche. 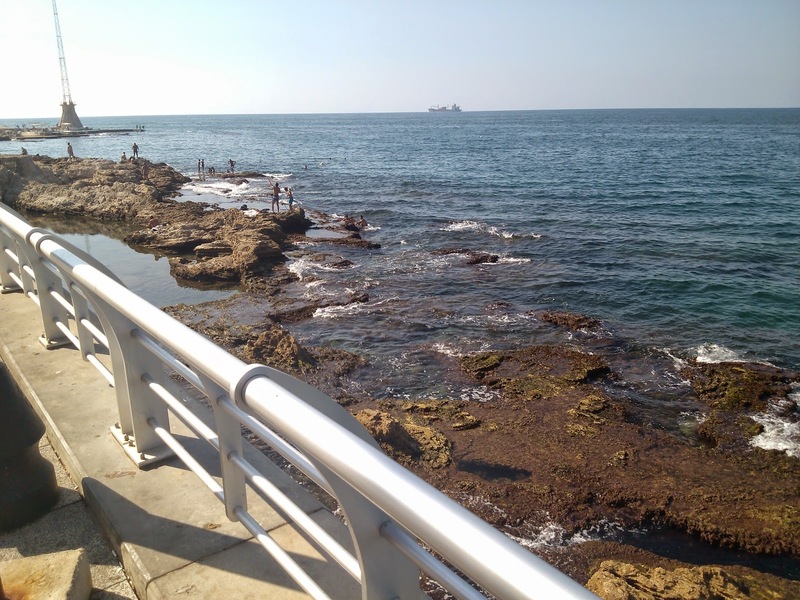 It's a grand promenade along the north and northwestern shore of Beirut, between Saint George Bay and the coastal highway. In another city, it would be a boardwalk, with commercial properties and the like, but aside from a few vendors selling fruit and corn on the cob and suchlike, there isn't much for sale here between the marinas every kilometer or two along the shore. People walk, run, or ride bicycles along the wide pavement, which has more than enough room to not crowd anyone one, at least not when I was there. There's a place renting bicycles and pedal-driven four-wheel carts about, hmm, two kilometers from the hotel, on the other side of the highway. As usual, you take your life in your own hands crossing traffic, but that's really the only way to do it. It isn't really a pedestrian's city. 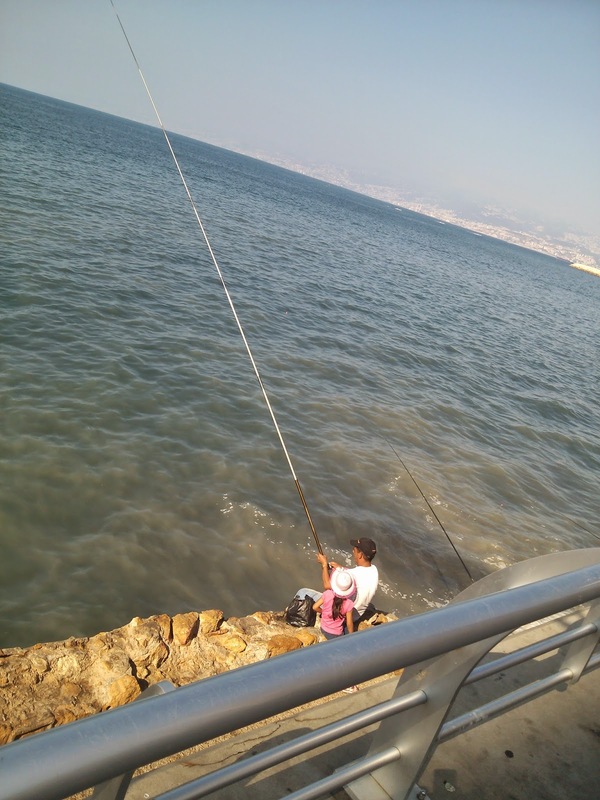 The bay along the Corniche is a major hang-out for the young men of the city. They climb down to the rocks below, and go swimming in the waters of the bay. There isn't any beach to speak of - and that's too mild a way of putting it - it seems to be just knobby brown rocks and ocean down there, of varying depths. 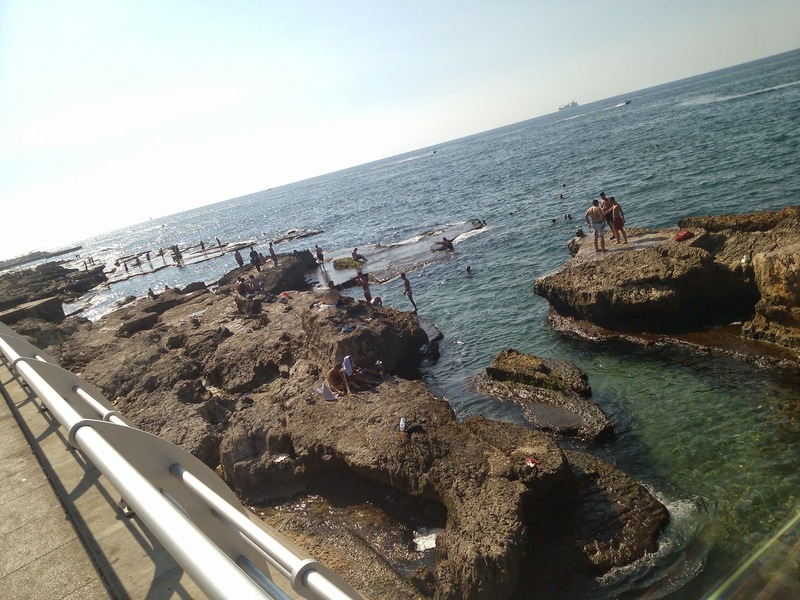 I saw at least one young man with scrapes all across his back from some sort of mishap, but the vast majority of them were just cheerfully splashing about without any concern for, oh, I don't know, being smashed against the rocks by the current or waves. presumably for the fishermen with their preposterously long pike-length fishing poles. I'm not sure what they were fishing for - it can't have been for the tiny little baitfish which was all I saw them hauling out of the water. 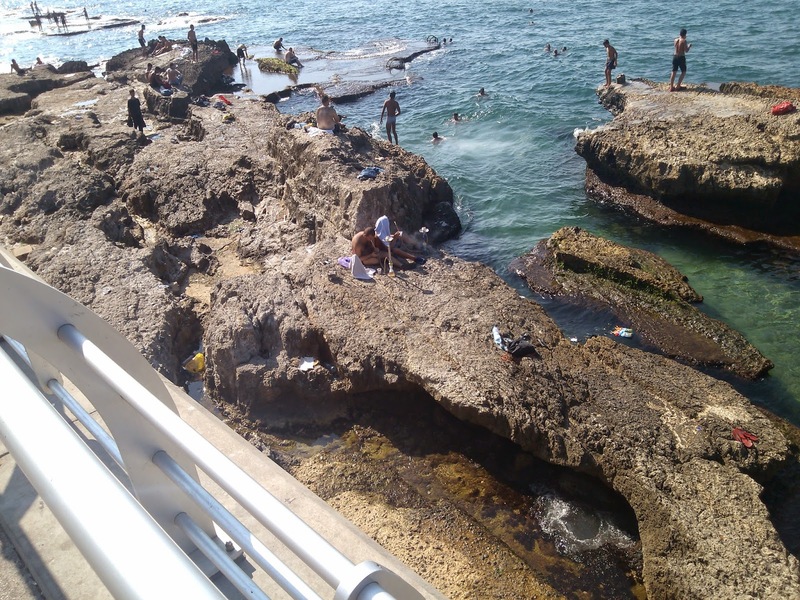 But in other places there were tall, vertical rings of iron sunk into the rocks, for swimmers to climb in and out of the water, and steps driven into the rocks, so someone had gone to some length to turn the rocky shore into a semblance of a park pool. There are plenty of people out just walking, as well. There was a local TV film crew doing man-on-the-street interviews. The reporter came up to me to ask me something or other, but I had to inform her that I spoke no Arabic. I guess people weren't kidding when they said that I could pass as long as I didn't open my mouth! So, Beirut. I stayed at the Bayview Hotel on Zaitunay or Saint George Bay on the north coast of the city. Jeremy recommended the hotel as being relatively safe and reasonable, and I found it to be so. The senior staff had enough English to help me navigate in a city where the primary language appeared to be Arabic. This doesn't seem to be a city where people are eager to come up to you and attempt to practice their English. 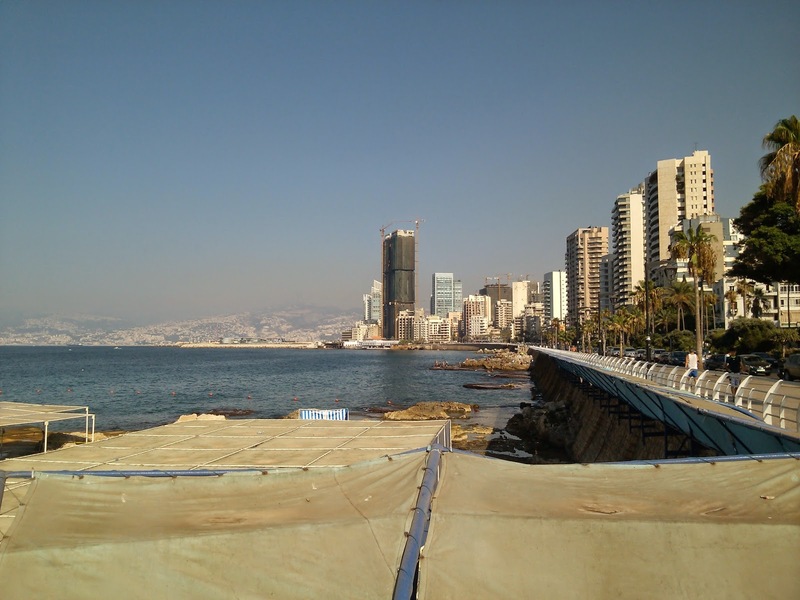 As you can see in the background of this picture, there's a lot of construction going on in Beirut, there was a massive high-rise under renovation or construction above the bay to the east of the Bayview, tall enough to put the hotel in its shadow. Building cranes rise in clusters throughout the city, and as I was to find, the single biggest import of Lebanon may well be construction cranes - they were springing up all over the coast, in clusters of two and three, over high-rises, apartment blocks, office buildings, beach resorts under construction, and in at least one case I saw, as jury-rigged loading rigs for a construction-supplies depot housing, yes, more disassembled construction cranes for transportation elsewhere in the country. The construction crane could very well replace the cedar as Lebanon's national tree. 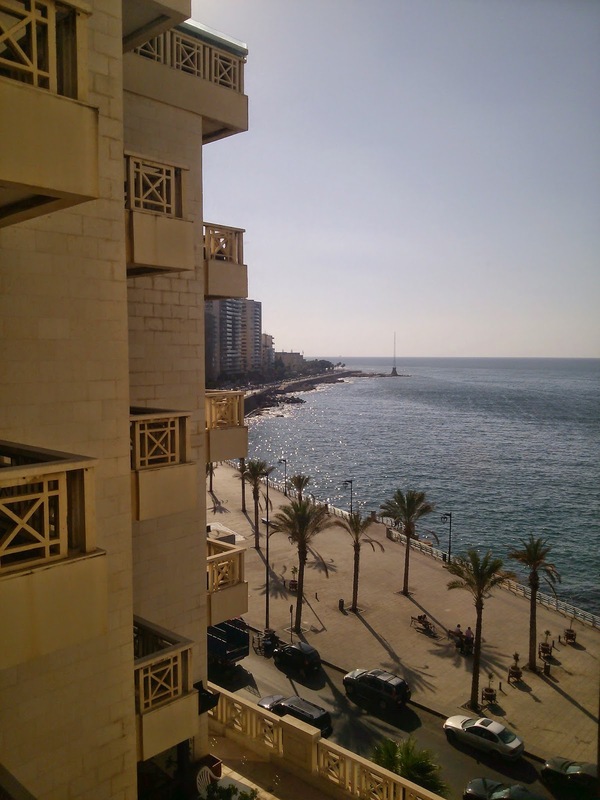 This is the view westwards along the Corniche from my hotel room. The Corniche is a promenade along the side of the bay, between the ocean and the coastal highway, which is a very busy divided highway, and must be a holy terror to drive during the day. Lebanese drivers are infamous even by third-world standards, but I found their reputation somewhat overblown. They didn't strike me as all that much worse than, say, Roman drivers, although late in the week I did come across a SUV which someone had driven full-tilt into a two-foot-tall block of concrete, crumpling in its fender and launching it high enough to leave its front hanging in the air, propped up as if a giant had just left it leaning there like a dog leaning on a divan, looking for a treat. Anyways, Lebanese drivers tend to signal by carhorn, which is something to watch out for, and probably one ought to give everyone a bit more space than you normally would if you were in a more... Teutonic country. They drive by Mediterranean rules here. 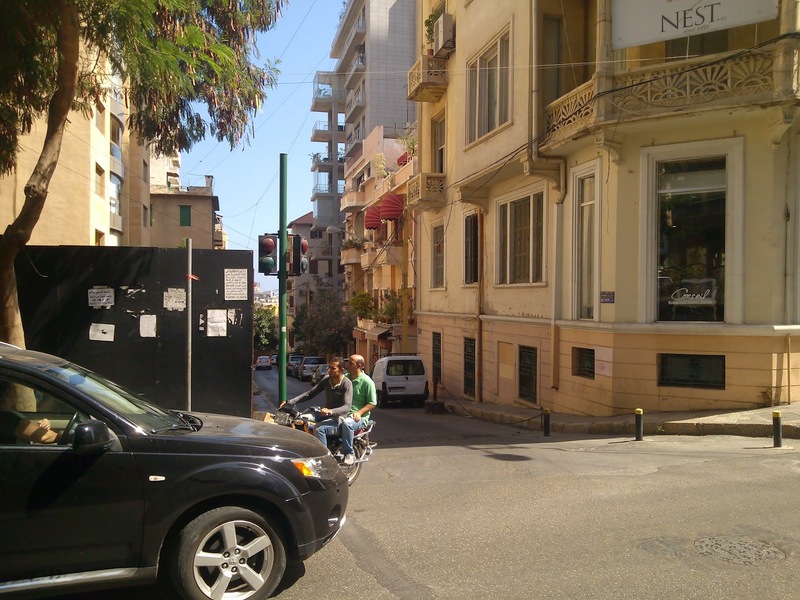 Walking around Beirut, I don't think I ever got to Hamra proper, and I wasn't familiar enough with the neighborhoods to identify where I *did* go, once I got out of the hotel district. I think I was mostly in the the higher-end district to the east and north of Hamra. As you can see, there are plenty of high-end shops, and lots of expensive European cars. 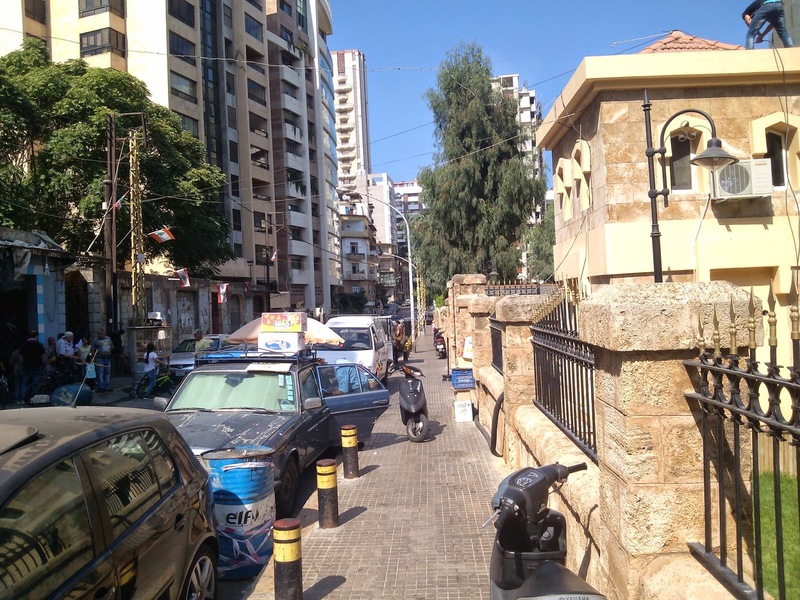 Cars are a big deal in Beirut, they're all over the place, and finding places to park them is a serious business. Every parking lot has at least two attendants, and one of them usually was in something approximating military fatigues, presumably. Which brings up the subject of the military. They were all over Beirut when I was there, manning checkpoints, guarding buildings here and there - including a Maronite Church, a cluster of banks, some government buildings (I think) and, for some reason, an entire squad camped out along a street next to this children's park, on the other side from where I took the photo. Presumably there were government buildings or party headquarters or something over on the other side, because I can't imagine why they'd be out in such force for a park. A remarkably nice park, mind you, but still a park. Beirut is very much an Arabic city in that greenery is a private good, locked away behind compound walls. Some of the only shade from the August sun was to be found from the dense bushy foliage pouring over this wall or that. 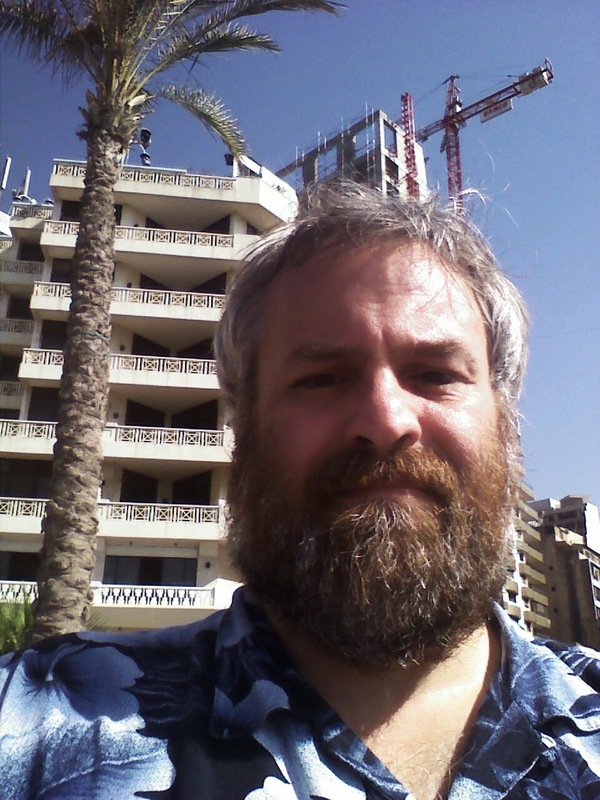 The section of Beirut I walked was, I think, Sunni, but honestly I don't know enough about the differences to be able to tell a Shia mosque from a Sunni one. There were a number of small mosques here and there, but there was a fairly large one across the street from the Bayview which broadcast the muezzin call to prayer via loudspeaker. Not oppressively loud, but I had been told that this did not happen in Beirut, which obviously was misinformation. 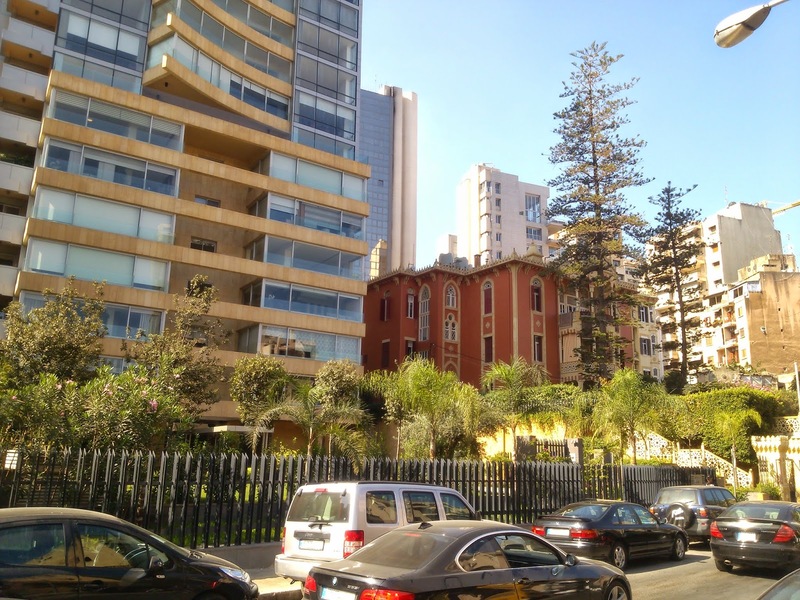 As I said, there's a lot of construction going on, but few parts of this part of Beirut are run-down and slummish. It's a city sloshing about with a lot of construction money, even now. 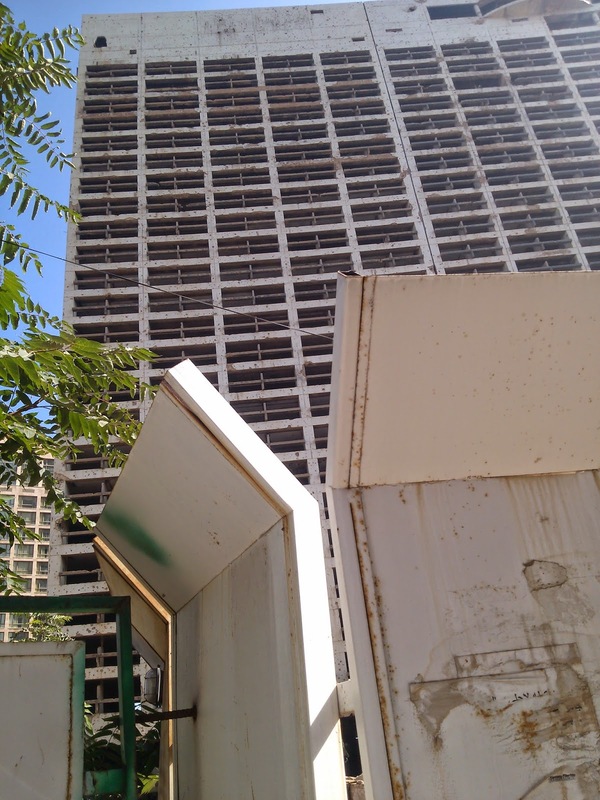 The exception being this relic of the Civil War, the ruins of the old Holiday Inn Beirut, epicenter of the Battle of the Hotels. It was heavily shot-up, rocketed and shelled during major fighting in the mid-Seventies, and seems to have been one of the few parts of the city which hasn't been torn down and replaced or renovated. But then, there's so many other active construction sites - I walked past at least a half-dozen in a single morning - that this one could just be the result of ambigious property ownership, lack of interest, or the fact that it's way the heck back from the rest of the hotel district and the active areas of the commercial districts around it. The city just has developed away from the old Holiday Inn. 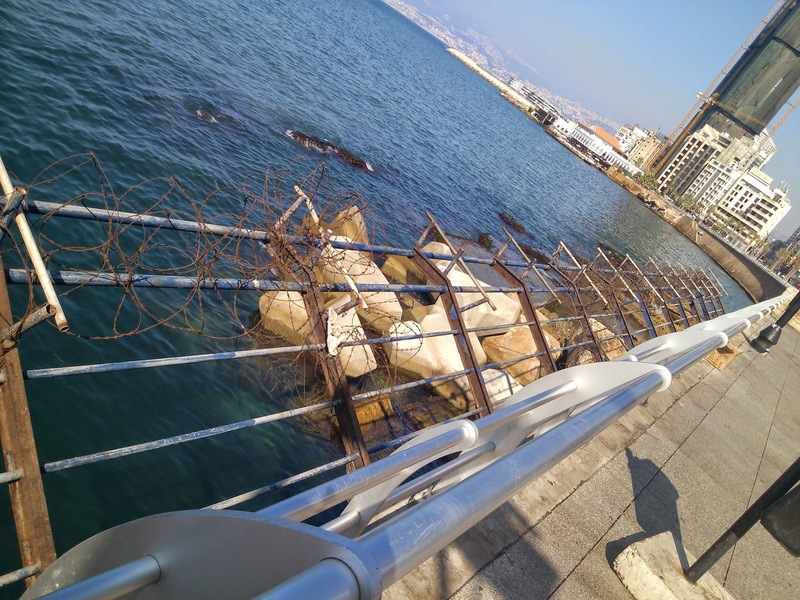 But like I said, you have to strain to find signs of the old Civil War wreckage and divisions in Beirut, and this is the exception to that rule.